before 8000 BC – Collecting of seeds for replanting. 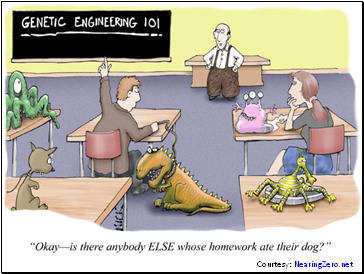 Evidence that Mesopotamian people used selective breeding (artificial selection) practices to improve livestock. around 7000 BC – Brewing beer, fermenting wine, baking bread with help of yeast. 8000 BC - 3000 BC – Yogurt and cheese made with lactic-acid-producing bacteria by various cultures. 1590 – The microscope is invented by Zacharias Janssen. 1675 – Microorganisms discovered by Anton van Leeuwenhoek. 1856 – Gregor Mendel discovered the laws of inheritance. 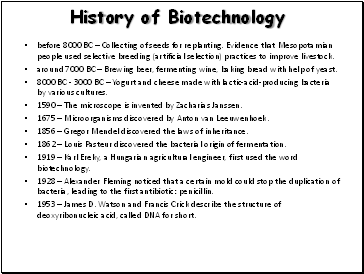 1862 – Louis Pasteur discovered the bacterial origin of fermentation. 1919 – Karl Ereky, a Hungarian agricultural engineer, first used the word biotechnology. 1928 – Alexander Fleming noticed that a certain mold could stop the duplication of bacteria, leading to the first antibiotic: penicillin. 1953 – James D. Watson and Francis Crick describe the structure of deoxyribonucleic acid, called DNA for short. 1972 – The DNA composition of chimpanzees and gorillas is discovered to be 99% similar to that of humans. 1975 – Method for producing monoclonal antibody developed by Kohler and Milstein. Modern biotech is characterized by recombinant DNA technology. The prokaryote model, E. coli, is used to produce synthetic insulin and other medicine, in human form. (It is estimated that only 5% of diabetics were allergic to animal insulins available before, while new evidence suggests that type 1 diabetes mellitus is caused by an allergy to human insulin). A viable brewing yeast strain, Saccharomyces cerevisiae 1026, acts as a modifier of the microflora in the rumen of cows and digestive tract of horses). 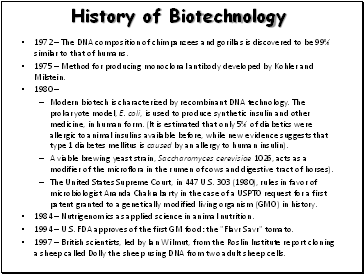 The United States Supreme Court, in 447 U.S. 303 (1980), rules in favor of microbiologist Ananda Chakrabarty in the case of a USPTO request for a first patent granted to a genetically modified living organism (GMO) in history. 1984 – Nutrigenomics as applied science in animal nutrition. 1994 – U.S. FDA approves of the first GM food: the "Flavr Savr" tomato. 1997 – British scientists, led by Ian Wilmut, from the Roslin Institute report cloning a sheep called Dolly the sheep using DNA from two adult sheep cells. 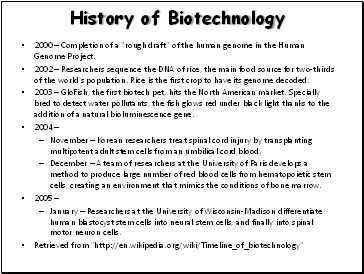 2000 – Completion of a "rough draft" of the human genome in the Human Genome Project. 2002 – Researchers sequence the DNA of rice, the main food source for two-thirds of the world's population. Rice is the first crop to have its genome decoded.